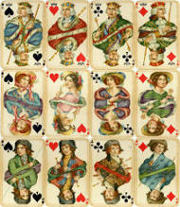 According to whist rules, in a match of online whist a standard deck (without joker, for a total of 52 cards) is used. In a typical whist game, the 4 players are divided in 2 couples, but a number of online whist variations exist, which span form 2 to 6 players. After the dealer is determined, he/she deals out all the cards, 13 for every player, one at a time, clockwise. According to whist rules, the last card (which belongs to the dealer himself) is turned face up (to reveal the trumps); the card will remain turned face-up until it's the dealer's first turn. Online whist is a trick-taking card game. According to whist rules, the first player may play any card in his/her hand; if the other players have a card of the same suits, they have to play it. Otherwise, they can play any card in their hand. The highest card of the suit wins the trick, but if a trump was played, then the highest trump wins the trick. The player who won the trick leads the next trick. According to whist rules, the cards rank from highest to lowest: A K Q J 10 9 8 7 6 5 4 3 2. The aim of online whist is to win at least 7 out of the 13 tricks total. During a whist match, no player is allowed to talk (the word "whist" means silence). According to whist rules, the couple who won more tricks gain 1 point for every trick won in excess of 6. Honours are the top four cards in the trump suit (A K Q J). The side who has all of them gains 4 points, according to whist rules; the side who has 3 honours gains 2 points. Tricks are scored before honours, and the last point of a match can never be won by honours points. According to whist rules, usually a match ends when one of the side reaches 5 points (but there are variations where whist games are played to 7 or 9 points). Even if online whist rules are vey easy to learn, mastering the card game and its many variations requires a lot of experience, which can only be gained by playing on the sites of free online whist.